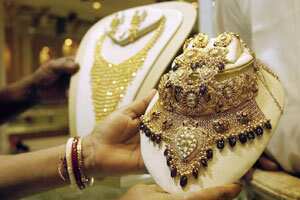 Mumbai: Gold edged higher on Wednesday afternoon boosted by firm overseas markets, though a stronger rupee at home reigned in the upside, keeping physical traders at bay, dealers said. Overseas gold prices firmed, riding on renewed safe-haven demand as fears about Greece’s debt crisis returned after its government shocked the markets with a call for a referendum on a European Union aid deal. The rupee bounced back, tracking local shares which recovered on foreign fund inflows, while gains in the euro also aided. The rupee plays an important role in determining the landed cost of the yellow metal, which is quoted in dollars. Physical buying retreated in India, the world’s biggest buyer of bullion, as traders awaited for price falls seeking to stock for the wedding season, which will last till December.